Data journalism is a journalism specialty reflecting the increased role that numerical data is used in the production and distribution of information in the digital era. Public issues journalism can be defined as narrowly as the coverage of government and as broadly as the coverage of the public life of the American people – the sum of their activities involving public institutions and public policies. On the previous Tuesday, your assignment was to represent Stanford tuition data using a hand-drawn chart. Let’s take a look at them, discuss what went terrible, and also, what to remember going forward with data visualization (especially computer-powered). More important than the aesthetic design, though, is the ability to understand the data, especially its limits. And later on, how to think of a single dataset in terms of what other datasets bring to it in tandem. Richness of data and insight is what drives great visualizations. What is the US’s “deadliest” mass shooting? Read: Meet the Man Who Spends 10 Hours a Day Tracking Police Shootings, with D. Brian Brughart. Before we jump head first into databases, it’s important to understand that for the vast majority of real-world situations, text is data. Whether it’s in a text editor, a spreadsheet, or SQLite. The city’s name had been listed in the wrong place on computer records, forcing the “d” at the end of “Hartford” into the column used to describe the status of prospective jurors. “D” stands for dead. And all you have to do is try to get DB Browser for SQLite installed on your own machine. Let me know if you run into any issues. The Census surname data is an example of data with a lot of continuous variables. Slow, hands-on exercise to make sure everyone can do the mechanicsl steps. You’ll also have a lot of reading to do by Thursday. Using ssa-babynames-nationwide.sqlite, let’s explore the popularity of “Hillary”. We don’t know yet how to do to do GROUP BY and JOIN in SQL, so we don’t have an efficient to find how poisoned the name ‘Hillary’ apparently is. But we can do the first part of Parker’s analysis, which is to get thge list of years and baby counts associated with girl babies. He also runs Data is Plural, a A weekly newsletter of useful/curious datasets. …Clery Compliance Coordinator Annette Spicuzza suggested that the increase in 2016 may be a result of an increase in actual reports rather than an increase in crimes themselves. 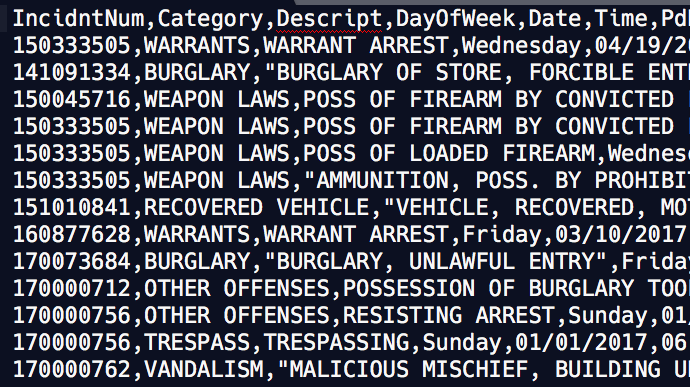 Articles and background information about a few real-world datasets that you’ll be writing queries for. As I’ve said before, SQL is something that you can eventually master in a quantifiable way. The “hard” problem of data journalism is understanding the real-world issues and implications of data – everything to why and how data is collected, how a datapoint relates to its corresponding real-world observations, and all the political and ethical issues of the data and its analysis. Being familiar with the issues of data is hard work, but the more familiar you are with data and its domain, the easier it’ll be to focus on the SQL query writing. How Clean Are San Francisco Restaurants? The last major concept about SQL that I think is worth covering is the LEFT JOIN. Very similar in syntax to INNER JOIN, but with a different set of results. Easiest way to explain is that INNER JOIN only returns combo-rows when there is a match between the different tables. In contrast, LEFT JOIN returns rows that exist in the “left” (the table first referenced) table, whether or not they have a matching row in the joined table – it’s easier to demonstrate than to explain. The upshot is that – whereas INNER JOIN efficiently finds when a thing exists in 2 different tables – the LEFT JOIN efficiently finds when a thing exists in one table but not the other, which can lead to interesting and otherwise very-hard-to-find stories. Homicide in New York City is not very interesting, or at least dramatic, due to the trend in falling crime rates. However, there are enough homicides to make covering every homicide a very costly task. So the NYT ran a series that focused on one slice of overall city crime: the precinct with the most deaths. Also in that section, more questions/queries to ask. Sorry for the lateness of this. Will try to be as brief as possible. Set up a data story appointment: Email me about what time this week (I guess there’s no reason I can’t do it Friday) that we can meet for a 15-min or so chat about the kind of story you want to do. And if you can, email me URLs to stories related to your idea so I can get a head start in gathering resources for you. If you want to do a summer internship interview for the Bee, email me what time from 11:15 to 12:30, or 3:00 to 3:30 you’d like to talk to Phillip. This isn’t an interview where it’s pass or fail, it’s casual, and you’ll learn as much about what the work might entail as he will about what you want to do. Bring a resumé. Feel free to ask me to give it a lookover if you want. The takehome midterm, actually, the final. I’ll send it out when it’s ready, hopefully sometime tomorrow. It will be due next Tuesday. Ideally, try to check out all the given links. But at the very least, read the following 3 stories from Phillip’s Pulitzer-finalist entry in investigative reporting, as they represent the spectrum between human-focused feature and compelling data package. The project looked at how a certain Nevada mental health hospital, desperate for space and resources, dealt with overpopulation by giving patients Greyhound bus tickets to where patients wanted – or at least thought they wanted to go. As you can imagine, sometimes this ended badly. The first story happened because a strange man walked from the bus into the nearest Sacramento police station. Phillip and his colleague Cynthia Hubert wrote a powerful profile about this man’s long and confusing journey, which included calls to the Nevada hospital. Phillip can explain more when he’s here, but if I remember correctly, they did not initially expect this longform profile of a single man to become a series or a data-backed investigation. The follow-up to the first story, a week later, opens up with a nationwide map showing where the Nevada hospital’s patients ended up. Phillip can talk about the data behind the map and how painful it was to collate (always the hardest part! ), but you can see that the map, while it looks nice, is actually a very basic map, one you can easily make in Carto, and one that bears the major flaws that come with every map. And yet this is the story that turned a one-off human interest story into one of nationwide interest. I think Phillip says that it was more the map than anything. You can read the other stories that Phillip and Cynthia produced over the years, but the last installment (at least of the Pulitzer project) is a fine example of how we can, with the same base data, have a completely different angle and compelling story. These other stories are more one-off features in which the visualization is the respective main feature. Even though Phillip is the “data guru” at the Bee, you can see from his Pulitzer work that he is as good as any enterprise/investigative reporter in producing long-form, hard-hitting stories. For their probe of a Las Vegas mental hospital that used commercial buses to “dump” more than 1,500 psychiatric patients in 48 states over five years, reporting that brought an end to the practice and the firing of hospital employees.